The Icelandic Mountain Bike Club was founded in 1989. It's a non-profit cycling club and grassroots organization. We are interested in bike culture, traveling by bicycle, we promote the use of the bicycle and advocate for better conditions for cyclists, the environment and sustainable development. 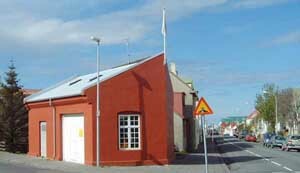 We are part of the Icelandic Cyclists’ Federation, lhm.is, which is part of the European Cyclists’ Federation, ecf.com. If you're in Reykjavik, Iceland you are welcome to visit us at our clubhouse at Brekkustígur 2, 101 Reykjavik, corner of Framnesvegur. We always like seeing new faces and making new friends. The house is open first and third Thursday night of each month from 8pm but closes for summer holidays so check the clubhouse schedule here (Opið=open, Lokað=closed). Cyclists gather there informally for a chat, some working on their bikes, maybe finding partners for weekend rides or getting advice organizing longer trips.